Just our way of saying THANK YOU for being such a great patient!! 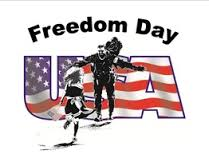 *This year Freedom Day will be held in November. To honor and serve our military, as they have sacrificed so much for us! You don't have to be a patient at our office for the provided services, but we hope you decide to make us your dental family.